In his bid for South Maui’s seat in the Hawaiʻi State House of Representatives (District 11, Kīhei-Wailea- Mākena), former Maui County Council member Don Couch will host his campaign kick-off at the Kīhei VFW Hall, 1136 Uluniu Road, on Wednesday, May 16, from 5:30 to 7:30 p.m.
“I hope the event encourages voters to meet me, ask questions and enjoy a local-style evening of ono grinds and entertainment,” Couch said. A suggested $20 donation to the campaign can be made at the event. Couch, who is currently an executive assistant to Maui County Mayor Alan Arakawa, served three consecutive terms on the County Council, from 2011 though 2016. During his Council service, Couch was Planning Committee chairman for six years and also served as vice-chairman of the Policy and Intergovernmental Affairs Committee. Prior to his council service he was deputy director of the Department of Planning under Arakawa. 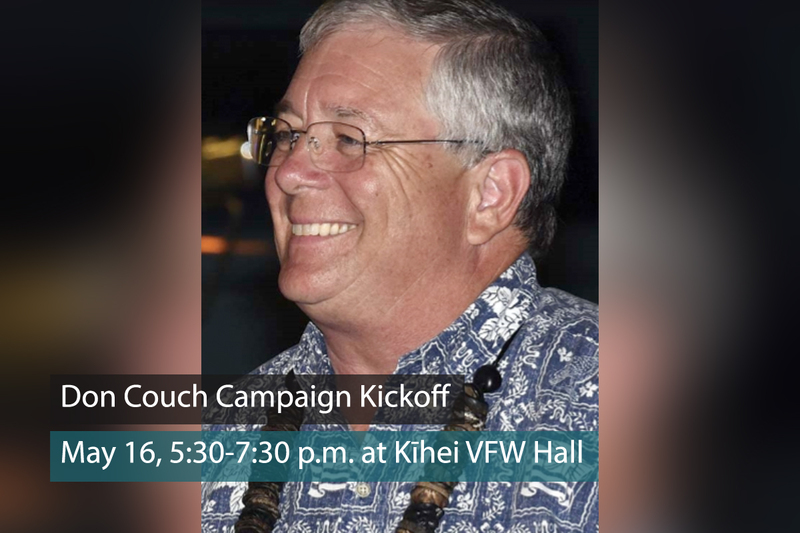 A 27-year resident of Kīhei, Couch was also a founding member of Kīhei’s “Fourth Friday Town Party”; served as a volunteer and board member of the Kīhei Community Association; and has been a member of the board of directors of the Boys & Girls Clubs of Maui since 2004. In his current position in Arakawa’s administration, Couch has represented Maui County at the state legislature on bills important to Maui. He is also working with the Department of Education to determine the safest pedestrian access to the future Kīhei High School.